News in overnight from Jose Arana Jr at Fraser yachts of price reductions on two of his motor yachts, the 28.04m LSX 92 and, in a joint listing with Thorsten Giesbert, the 31.4m Marlena II. Firstly, LSX 92 was delivered by Lazzara in 2009 with accommodation for eight guests in a master suite with a fold-down terrace over the sea, plus three double staterooms. A notable feature is an aft garage that, when the toys are out, converts into an outdoor teak-floored beach area. Power is delivered by four Volvo IPS 900 systems offering a 30% reduction in fuel consumption over conventional shaft drives and LSX 92 is now down from $5.9 million to $5.75 million. 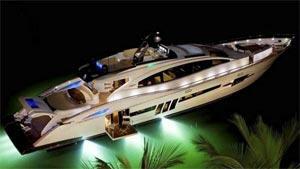 Then there's Marlena II, a classic example of a 2005 31.4m Overmarine Mangusta jet driven motor yacht. She is stylish, fast and comfortable while always maintained to impeccable condition with full certification. Contemporary accommodation is divided into four ensuite staterooms. With two large saloons, there is plenty of space for guests to enjoy themselves. An ample aft deck includes a dining table and sun loungers and the foredeck supports a shaded sun pad. Marlena II is down from €3.85 million to €3.45 million.